Ever since Bram Stoker wrote his masterpiece “Dracula” there have been plenty of retellings and stories based around this character. “The Curse of Dracula” by Marv Wolfman, his first ever vampire story, is one of the better stories out there. Taking place in the modern day, Dracula is secretly helping a politician get elected as president. Meanwhile, Jonathan Van Helsing and a crew of vampire hunters go to San Francisco to investigate a string of grisly murders. These murders, of course, are done by Dracula’s minions. The best way to describe this comic is that it’s “CSI” meets “Castlevania.” There’s plenty of mystery and political intrigue here. It’s pretty entertaining. Seeing Dracula help a politician win an election is a pretty ingenious idea. Wolfman handles that angle well and without resorting to any shortcuts or cheap tricks. The “Casltevania” part is that, besides it being Dracula, there are vampire hunters with plenty of personality. You’d love them the second you see them. The only problem with these characters is that, though they are well developed, they are a little underused. Take, Hiro, the blind half-vampire for example. She has the most interesting back story and the fact that she’s blind could’ve had plenty of possibilities. Instead she really doesn’t do much and we see very little of her vampiric powers. The other problem is the ending. It feels rushed and that there’s so much more to the story that it just wasn’t resolved at all. Gene Colan’s art and Dave Stewart’s colors greatly help give the comic its charm. The characters fit into this macabre style that makes them look grim and grisly and the clever use of colors sets the comic’s mood nicely. The shading also helps with giving that Dracula feel that brings in readers. 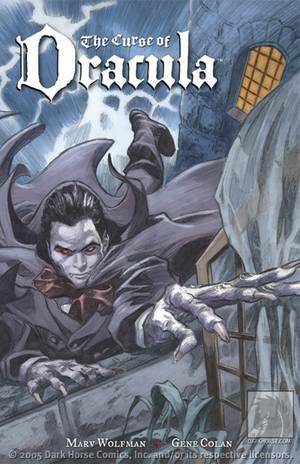 “The Curse of Dracula” is one of the better Dracula stories out there. The story is well written with interesting characters even though they were a bit underused and it has some awesome art. Disappointing ending aside, this one’s worthy of Bram Stoker’s blessing.